Making the decision to pursue guitar lessons is an exciting prospect. However, as the first session approaches, many students find themselves wondering: what do you need to know before your first guitar lesson? At Sage Music, we offer a unique approach to our lessons that is unlike any other music school. Here, we’ll offer an overview of what you need to know before you take your first guitar lesson. Don’t worry, it’s not scary at all! Reading through these tips will help make your first lesson as enjoyable as possible. One of the first important things to know before you take your first guitar lesson is what you hope to gain from your studies. During your first lesson, you’ll consult on this very subject with your teacher so that they can help create a customized study plan that will be aligned with your personal goals. So, be sure to take a few minutes to consider what you hope to gain from your guitar lessons. Do you want to be able to jam out during camping trips? Or do you want to be able to play along with a group? There’s no right or wrong here; just come up with an answer that is true to you. What type of guitar lessons do you want to take? Did you know that there’s more than just one style of guitar playing? At Sage Music, we offer guitar lessons in a variety of styles, including acoustic guitar lessons, electric guitar lessons, jazz guitar lessons and classical guitar lessons. To make the most of your guitar lessons, be sure to think about what type of lessons you’d like to take beforehand. This will help you choose the best teacher and course of study for you. It can also help you attain your goals in the most streamlined way possible! On the Sage Music website, our “Getting Started with Music Lessons” page offers information on this subject. For example…what about the guitar? While it is best to bring your own guitar for lessons, if you do not have one, Sage Music does have several guitars available for students to use. We can also rent guitars to students who are not able to afford one right away yet want to play on a quality instrument. By consulting with the school beforehand, you can figure out the best solution for your situation. Figuring out what type of schedule you can commit to for guitar lessons is an important consideration before you begin lessons. If you really want to stick with your studies, you’ll really have to figure out a schedule for lessons that you can stick to. At Sage Music, we offer tuition packages starting at $199 per month, which includes 4 private lessons. You’ll want to make sure that you’re making the most of your investment by committing to a regular schedule! Students who take weekly lessons make great progress. Students who take two lessons per week do the absolute best. When you start your lessons at Sage Music, you don’t need to come in with a particular level of knowledge. While prior experience or knowledge won’t hurt, it’s not necessary to take guitar lessons at Sage Music. You can in fact be a complete beginner. As you begin your lesson, your teacher will guide you through all the basics. This includes addressing posture, how to hold your instrument, and other key techniques before you even start strumming. Building your knowledge from the base up will help you form a strong playing foundation. There’s no need to be shy. If you have questions about your guitar lessons, ask away! Communication and community is part of the learning process at Sage Music. We want our school to provide an opening and welcome atmosphere to discover music on your terms. We want to be your guide, but are open to you discovering the process in your own unique way. As your studies continue, you’ll feel a sense of accomplishment as you reach milestones in each lesson. At Sage Music, we want to help your musical journey unfold in a fun and natural way. This first lesson is just the beginning! Preparing for your first guitar lesson should not be a stressful experience. At Sage Music, we believe that music lessons should be inviting and inclusive. As you can see by reading the above, while there are various ways in which you can mentally and physically prepare, the most important thing that you can bring is yourself and a willingness to learn. Let the musical journey begin! Have you ever taken a guitar lesson? 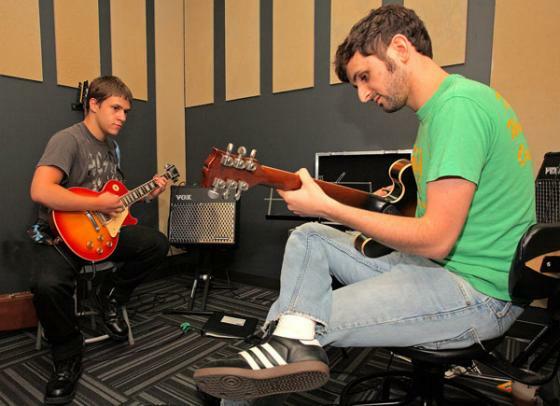 Get More Information on Guitar Lessons Today!